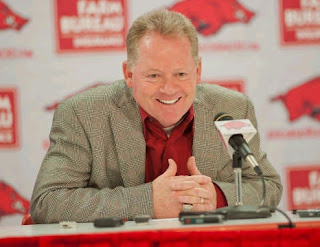 We got some news in the world of the SEC today in that Bobby Petrino would take the job at Kentucky if he were to be offered it, according to his old man. And you know what, it is a perfect fit and should happen. Listen, we all know the deal with Bobby Petrino. The flirting with Auburn after only one year at Louisville. The leaving for the NFL less than a year after signing a ten-year deal at Louisville. Leaving the Falcons for Arkansas less than one full season in his tenure in Atlanta. And most notably, lying to Arkansas AD Jeff Long about the extent of the motorcycle crash with his mistress, who he had also hired in a administrative role with the program. A classy guy, he is not. But in the world of college sports, we do not discredit guys for ethical problems, we only care if they can win. Yes, what Petrino did at Arkansas was despicable, without a doubt. But you know, we are a forgiving nation and when you are apologetic, like Petrino was after the fact, that is generally good enough to get back into (somewhat) good graces. Meanwhile, Kentucky football has been crap the last couple of years after going to five straight bowl games at the end of the Rich Brooks tenure and the first year of the now-fired Joker Phillips era. It will always be tough to win at Kentucky because it is such a basketball school in what is and will always be a football-dominant conference. Petrino has had a lot of success in the state of Kentucky, as the coach of Louisville, also conveniently a basketball dominant program, and is a proven winner in the SEC. I know Kentucky has pooh-poohed the idea of bringing in Petrino but if you bring in John Calipari, who came with his fair share of baggage, including NCAA violations, something of with Petrino has none of, why would you not bring in Petrino? Especially as he'll probably be coaching next season at Auburn if not at Kentucky so in a way, you would be killing two birds with one stone. If AD Mitch Barnhart cared about his school's football program (and that is certainly up for debate), he would bring in Petrino.